This week a friend I used to work with at Lutheran World Relief came to Arusha to lead a training for the regional management staff. She kindly brought along the Christmas gifts my family had gotten for Max and Elly. 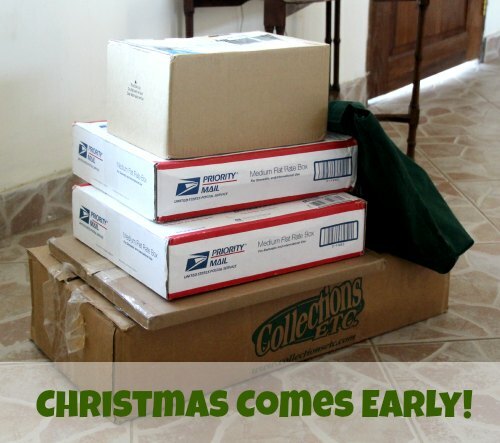 I had heard in late September she would be coming so it was quick work to let the family know and give them time to do their shopping and ship their packages to Baltimore before her departure date. I’m lucky that many of the people I worked with at LWR have lived overseas themselves and know the joy a package from home can bring so they are always willing to carry stuff for me. There were a few goodies included for Mommy and Daddy, too–chocolate chips, dried cranberries, M&Ms, and yummy Bakers chocolate melt-a-ways made in Greenwood, Nebraska. And some Red Bird Soft Peppermint Puffs for Kakasii (he loves those things). I really wish I had a closet in my bedroom with a high shelf to hide the Christmas presents like my mom did when we were kids (yes, Mom, we knew where you hid the Christmas presents). Instead I’ll have to tape up the boxes with about six layers of packing tape and then hide them under the suitcases and hope that two little snoops don’t come across them. 2 Responses to Christmas Comes Early! Glad to know the boxes have arrived. Thanks again to Mercedes for being the courier. I hope Max & Elly enjoy their kitty pillows as much as someone else I know enjoyed hers.